A single web interface to provision all end-user required configurations. Allow basic trained staff to carry out day-to-day MACDs. Console for Helpdesk: MACD requests are received via a support tool or email. Limit access for site administrators, customers or helpdesk to manage their ‘own’ users and phones and specify which settings can be modified by pre-defining available values. Eliminate configuration mistakes by defining site and location based parameters which allow everyone to perform prvovisioning without prior knowledge. A single customisable interface that only provides editable fields that are relevant to a specific site or UC deployment. Perform any MACD operation in less than 30 seconds including email notification! Re-use information from Active Directory to prefill location based templates to reduce efforts and to minimise data entry errors. Email notifications to requester, end-user or administrators. Automatic detection of added, changed or deleted users in the enterprise through the Active Directory change tracker. Portal page (Self-service or to place orders). API Integration allows your organization to further leverage the Provisioning System by integrating it into 3rd party systems. 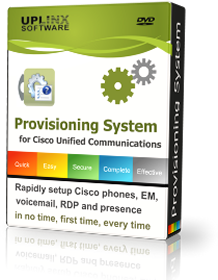 Provision users and devices from your existing systems with less than 10 lines of code. Provides workflow for a help desk with provisioning console, reporting on changes and requests, pre-fill email to notify requester.